FDA Weighs Safety Of Bisphenol A A new study says people with high amounts of bisphenol A in their urine were more than twice as likely to be diagnosed with diabetes or heart disease. The study's author was at a Food and Drug Administration meeting Tuesday on BPA's safety. A new study says people with high amounts of bisphenol A in their urine were more than twice as likely to be diagnosed with diabetes or heart disease. The study's author was at a Food and Drug Administration meeting Tuesday on BPA's safety. A new development today in the matter of whether Bisphenol A, or BPA, is safe. BPA is a chemical commonly used in food containers and bottles. A new study suggests that people exposed to lots of BPA are more likely to be diagnosed with diabetes and heart disease. The study was published this morning in the journal of the American Medical Association just as the FDA convened a meeting on whether it should reassess the chemical. The FDA has said BPA is safe. NPR's Allison Aubrey was at that meeting, and she joins us now in the studio. Allison, first of all, tell us more about this study. What was discussed at this FDA meeting? ALLISON AUBREY: Well, at the FDA meeting the author of the paper was actually there, so he presented a summary of his analysis to the FDA committee, the subcommittee. And most of them hadn't seen the paper, hadn't had time to review it. The main finding of this paper is that in a study of about 1,400 adults, people who had high amounts of BPA in their urine were more than twice as likely to have been diagnosed with diabetes or heart disease, and that's compared to those who had the lowest level in their urine. So it's a significant finding because it's a human study, albeit a snapshot in time. Now, I should say that it does not prove a cause and effect, but the studies the FDA has been relying on to determine whether the amount of BPA in food containers is safe, these are animal studies. So, yes, this is a significant study. NORRIS: Now, as we've said, the FDA has said that BPA is safe. Tell us more about their position and how they came to that position. AUBREY: OK. Well, the whole reason they called the meeting today is that they wanted to discuss their draft proposal that's on the table now for reassessing the safe limits for BPA in food containers. Now, what the draft concludes is that there's already an adequate margin of safety at current levels of exposure. So, they're basically arguing that they don't need to change what's called - and this is going to be sounding like bureaucratic acronyms, and it is - but the NOAEL limit. And that stands for the No Observed Adverse Effect Limit, or bad effect limit. So, the committee is being asked to weigh in on whether they agree with this assessment. NORRIS: Now, does this new paper out today change things, the reassessing against that NOAEL limit? AUBREY: That's right. Well, it really remains to be seen. So, the subcommittee has now about six weeks until October 31st to look at the draft proposal, weigh in. And some of them began to tip their hands a little bit at the meeting by asking why the draft proposal didn't include one study or the other, why it relied on just a few studies. Many of the independent scientists at the meeting today and some policy advocates who spoke publicly were very, very critical. They said the FDA is relying mostly on industry-funded studies and ignoring other new studies, some of which have been published in peer review journals. And the one today is a good example. One FDA official at the meeting, Laura Tarantino, defended the proposal that the FDA has on the table. She basically said, you know, of course the FDA will continue to look at new evidence as it comes in, even if it is not part of this official draft. NORRIS: Allison, a question that will take us out of the meeting into people's kitchens and living rooms and, perhaps, the nursery. 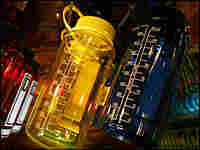 A lot of consumers are worried about using baby bottles, other containers that have BPA in them. Where does this leave those people? AUBREY: Well, a couple of points to make here. If you're concerned about exposure, keep in mind that the most substantial exposure does come through these food containers. The National Toxicology panel recommends not microwaving food in plastics because the chemical compounds can leach and the degree of leaching really depends on temperature. So, also, they're recommending not dishwashing or using harsh detergents because repeated exposure to the high temperatures of a dishwasher can deteriorate the plastic and release the BPA. NORRIS: You see it right there on the label. NORRIS: Just quickly, before I let you go. How do you know, if you don't see that label, if a container or product has BPA in it? AUBREY: It's a really good question, and there is no way to be certain. It's obviously not listed as a food ingredient, it's not labeled. It is widely distributed and pretty ubiquitous. NORRIS: Allison, thank you very much. NORRIS: That's NPR's Allison Aubrey. In some versions of this interview, we mistakenly said 7 pounds of bisphenol A (BPA) are manufactured each year. The correct figure is 7 billion pounds.